ANN ARBOR, Mich. – Among children in the United States, firearm-related fatalities are the second leading cause of death. Such preventable injuries include the unintentional shooting of a toddler who finds a gun, the use of a firearm to self-inflict harm by a suicidal teen, the escalation of fighting or dating violence, lethal use by an adolescent or a tragic school shooting. 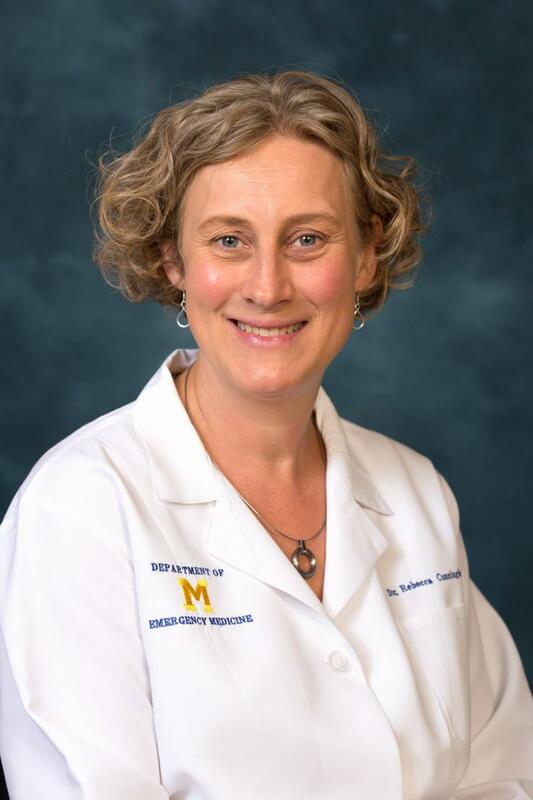 "Research and training in the field of firearm injury prevention needs to be substantially increased to develop evidence-based solutions to prevent and reduce firearm injury," says Rebecca Cunningham, M.D., a professor of emergency medicine at Michigan Medicine and the University of Michigan School of Public Health and associate vice president for research-health sciences at U-M. "There is a current deficit of data-driven solutions." She notes: "Reducing firearm-related deaths requires an injury-prevention science. If we apply that science the same way we have for car crash preventions and deaths over the years, we can likely reduce the deaths caused by gun violence." The National Institute of Child Health and Human Development recently awarded $5 million to U-M to lead a research-capacity-building grant that involves more than 20 researchers at 12 universities and health systems across the nation. The new consortium brings together expertise from many fields, including scientists from public health, adult and pediatric emergency medicine, pediatrics, criminal justice, psychiatry, psychology, data science and trauma surgery. "The large problem of gun violence, as it affects children and adolescents in the U.S., cannot be solved without an interdisciplinary group of scientists coming together to bring their individual expertise to develop solutions to this complex issue," says Frederick P. Rivara, M.D., MPH, professor of pediatrics and adjunct professor of epidemiology at the University of Washington. This gap is what led Cunningham and fellow principle investigator, Marc Zimmerman, Ph.D., a professor of public health at the U-M School for Public Health, and Patrick Carter, M.D., an assistant professor of emergency medicine and part of the consortium leadership team, to seek funding to jump-start this field of pediatric and adolescent research. Known as the Firearm-safety Among Children & Teens Consortium (FACTS), the consortium is made up of faculty from the University of Michigan, Michigan State University, Rhode Island Hospital/Brown University, University of Washington, Arizona State School of Criminology & Criminal Justice, Columbia University, Harvard T.H. Chan School of Public Health, Medical College of Wisconsin, University of Pennsylvania, University of Colorado School of Medicine, Ann & Robert H. Lurie Children's Hospital of Chicago/Northwestern University and Children's National Health System. Cunningham notes that stakeholder groups will be an important asset to the academic conversation and will include gun owners and firearm safety trainers, educators and law enforcement partners, including teachers, parent groups and hunting and sports enthusiasts. "The consortium respects gun ownership as an important part of the cultural fabric of our society in this country," Zimmerman says. "Having a stakeholder group that has a wide variety of political views and is providing input along the way will be invaluable to our joint goals of preventing firearm injury and death among children." First, the group is creating a research agenda for the field of firearm injury specific to pediatrics that will be published this fall — something they note is absent currently in the United States. "The Institute of Medicine (now the National Academy of Medicine) put out a broad report in 2013 but it didn't have a research agenda on the firearm issues specifically affecting children," says Stephen Hargarten, M.D., MPH, professor and chair of emergency medicine and director of the Comprehensive Injury Center at the Medical College of Wisconsin. "Our workgroups are already reviewing current literature to highlight those issues and find the research gaps, and by the end of the summer, we will publish the 'big questions' that require investigation." The second resource is the completion of five small projects in some of the areas within the field of firearm-related injury that are needed to generate preliminary data that can be expanded into large investigations. The topics for the projects will be determined during the investigation of gaps in the field but will include a focus across the spectrum of epidemiology and prevention and investigation on needs and practices following youth involvement in firearm violence. "I have written extensively about success stories in reducing injury and violence," says David Hemenway, Ph.D., a collaborator on the FACTS consortium and professor at the Harvard T.H. Chan School of Public Health. "In every one, research was important. It's something we haven't had enough of in our societal efforts to reduce firearm violence." The consortium will create a data archive on childhood firearm injury. The consortium will also train a cadre of new researchers, including postdoctoral trainees and graduate students, focused in this research area, as well as provide a webinar series to educate researchers on this topic of injury science. "There are not enough researchers, trainees, junior faculty or funding for seed projects in this research area and this is truly a capacity-building grant to jump-start the field of pediatric firearm injury prevention," Cunningham says. "This grant will have a significant effect on reduction of firearm injury; however, to prevent childhood firearm injury and death will require similar resources as have been applied to childhood cancer, motor vehicle crashes and asthma." "The FACTS team of scientists are meeting and working together regularly," Cunningham says. "We're looking forward to this fall when the pediatric specific research agenda will be complete and the core research projects will kick off." Building Research Capacity for Firearm Safety Among Children is project number R24HD087149 and funded by the National Institute of Child Health & Human Development.